Lamb and rice make a delicious combination and a treat for little dogs. Diamond Naturals Small Breed Adult Lamb & Rice Formula Dry Dog Food offers a holistic diet made from 100% real lamb, real fruit and vegetables such as kale, peas, blueberries, and coconut. In addition, the formula includes minerals, probiotics, and omega fatty acids which assist in your dog’s healthy skin, antioxidants, shiny coat. Lamb is the main ingredient and protein which provides lean nutrition and muscle growth. The kibbles contain rich nutrients and are highly digestible. Diamond Naturals’ proprietary probiotic blends maintain your canine’s digestive system healthy. The formula contains no corn, wheat, filler, artificial flavors, colors or preservatives. Diamond Naturals is made in the United States. Lamb, Lamb Meal, Ground White Rice, Cracked Pearled Barley, Peas, Chicken Fat (Preserved With Mixed Tocopherols), Egg Product, Dried Yeast, Pea Flour, Dried Beet Pulp, Natural Flavor, Flaxseed, Potassium Chloride, Salt, Choline Chloride, Dried Chicory Root, L-Carnitine, Kale, Chia Seed, Pumpkin, Blueberries, Oranges, Quinoa, Dried Kelp, Coconut, Spinach, Carrots, Papaya, Yucca Schidigera Extract, Dried Lactobacillus Plantarum Fermentation Product, Dried Bacillus Subtilis Fermentation Product, Dried Lactobacillus Acidophilus Fermentation Product, Dried Enterococcus Faecium Fermentation Product, Dried Bifidobacterium Animalis Fermentation Product, Vitamin E Supplement, Beta Carotene, Iron Proteinate, Zinc Proteinate, Copper Proteinate, Ferrous Sulfate, Zinc Sulfate, Copper Sulfate, Potassium Iodide, Thiamine Mononitrate (Vitamin B1), Manganese Proteinate, Manganous Oxide, Ascorbic Acid, Vitamin A Supplement, Biotin, Niacin, Calcium Pantothenate, Manganese Sulfate, Sodium Selenite, Pyridoxine Hydrochloride (Vitamin B6), Vitamin B12 Supplement, Riboflavin (Vitamin B2), Vitamin D Supplement, Folic Acid. When transitioning to Small Breed Adult Lamb & Rice Formula Dry Food, Diamond Naturals suggests you gradually introduce the new food for a period of 7 days. If your little one has a food sensitivity, Diamond Naturals advises extending the introductory period to at least 14 days. Start by placing small rations of the new food to the current one. Increase the amount of the new food daily while reducing the ration of the old food. By the 7th or 14th day, your dog should be eating his/her entire portion of Diamond Naturals’ kibbles. Diamond Naturals suggests you follow their recommendations listed on each of their dry food bags. Each food is portioned according to weight. However, you should consult with your canine’s veterinarian prior to making any changes to your dog’s diet. In addition, always make sure your dog has a bowl with plenty of clean water. 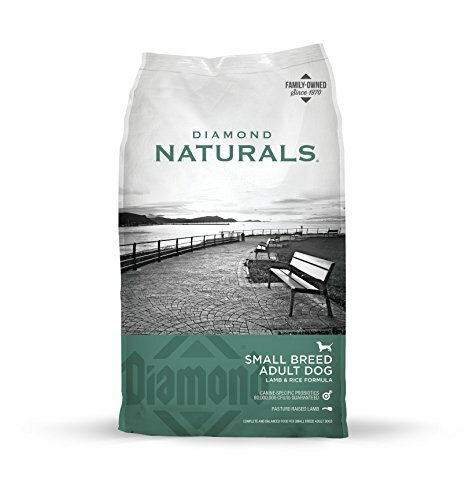 Diamond Naturals Small Breed Adult Lamb & Rice Formula Dry Dog Food is specially formulated for dogs weighing under 18 pounds. This dry food makes a good nutritional diet for adult extra small, toy breeds, and small breeds. The lack of corn, wheat, and soy provide a healthy and holistic diet while the real lamb provides healthy protein from the meat. Enhanced with proprietary probiotics, Diamond Naturals’ kibbles supports a healthy digestion and strong immune system. The superfoods included in the formula contains chia seeds, pumpkin, quinoa, coconut, and spinach. Prebiotic fibers are taken from chicory root which includes soluble and insoluble fibers. If you are thinking about putting your little one on a holistic diet, Diamond Naturals Small Breed Adult Lamb & Rice Formula Dry Dog Food might be a good start.